There is a huge range of canna varieties out there (411 apparently). I have merely dipped my toe into the varieties pool. The following canna varieties are the ones I seem to have gravitated towards. Where do they come up with these names? Who ever first wrote this name down, must have had the name spoken to them, over the phone, by someone eating an over-filled, grated-cheese sandwich. This plant should be the darling of the cool tropical garden. It is easy to raise in large numbers. The plants produced are reliably consistent. Canna Warscewiczii is the most elegant of the canna varieties. 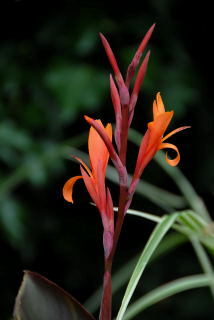 It is classified as a species canna. The plants Achilles heel has to be its occasional susceptibility to canna virus. You can offset this problem however by over producing plants. If one or two of them develop symptoms, you can pull them up and stick in a replacement. The beauty of this plant is that it gives your garden cohesion. Instead of having a number of large tropical foliage plants growing in your garden... you have a number of large tropical foliage plants bursting through a sea of luxuriant foliage. Just saying that sounds better. I like to snake these plants through the garden. They hold everything together. The plants shown in the above picture were seed raised in late February, the photo was taken in mid July. The flowers are not huge as with the hybrids, but are unaffected by torrential downpours. Water off a ducks back if you like. If you have 20, 30, 50 or more plants then small and subtle is more desirable. Canna Warscewiczii is a species canna and as such is one of the canna varieties easily grown from seed. From your initial purchase, you should be self sufficient in seeds after one season. If you follow the guide lines in Growing canna from seed there is no reason why you can't get close to 100% germination with these plants. Occasionally, one or two seedlings may subsequently fizzle out. These particular plants were probably bindweed in a former life and it is just Gods way of meeting out justice. 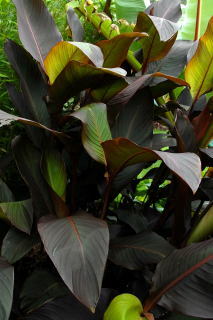 Of all the canna varieties, canna Warscewiczii has reputation of being difficult to overwinter. This gets a sort of 'well yes and no' type of response. Left in the ground with a protective mulch, these plants are reluctant to re-grow. However if the plants are lifted, washed down then re-potted and placed on a heat mat they will regrow. 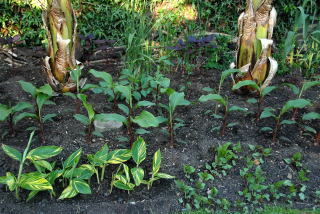 The image to the right is of a canna Warscewiczii rhizome after one seasons growth, from seed. Despite this I always choose to grow canna Warscewiczii from seed. There are a number of reasons for this. One reason is that I enjoy it. Another consideration is the available growing space you may have. Lets say you wish to grow 30 plants. Digging up 30 plants, washing and re potting is a considerable work load. Each of these plants will need a 3 litre pot. Each pot will take up valuable greenhouse space. No doubt you will have other plants you also wish to bring into growth on heat mats. Growing from seed helps to free up available space for plants that can't be easily propagated from seed. Growing them from seed, initially uses much less space. They will produce a respectably sized plant by the end of the season. As the plants grow and take up more room you can free up space in the green house by placing other plants outside. The time will come for planting once the danger of frost has passed. Position your plants where you wish them to grow in your garden. Play around with the positioning. Seed grown plants should be planted with a spacing of approximately one foot (30cms) between them. By mid July they will have knitted together hiding bare soil and giving the weeds a hard time. Mix a generous trowelful of home made compost and composted manure into each planting hole. Check each plant for aphids then pop them in the ground. 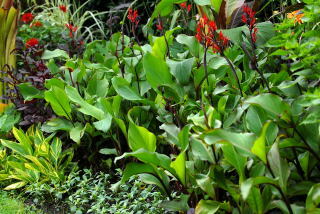 Plant each canna in a slight crater so that water goes where you want it. This picture is of the same border as the first image on this page (different angle). Taken 2 months earlier, followed by a miserable, wet, cold, sunless and very windy break from winter that we are sometimes blessed with in England. That's it really, water them well in dry weather. Watch out for slugs and snails during wet weather. When the frosts wipe the foliage out, dig up the plants, squash the rhizomes and into the compost bin they go. 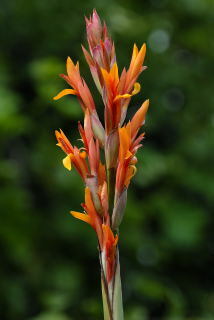 Another species canna, canna Altensteinii (yet another name that just glides off the tongue) is easily grown from seed. This plant is large with bright apple-green foliage and orange flowers. Again with smallish, weather proof flowers characteristic of canna species producing bucketfuls of seed. This canna variety is grown initially from seed. Select the strongest growing plants at the end of the first season. 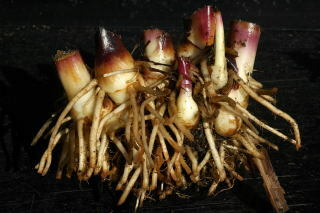 The rhizomes of this plant are quite large and bulk up very quickly so you can afford to discard any feeble contenders. The plant shown here is the result of one seed, two and a half seasons old. The plant was grown from seed and planted into the garden. The following spring it was lifted and divided into two. Both sections were planted for this clump. It spent the next winter in the ground and was brought into growth using clear plastic sheeting to warm the soil. This canna was in flower by mid July. This plant makes a good cheap alternative plant to canna musifolia and is far less lanky. The flower spikes reach over 8ft (2.5metres), the leaves 20 inches (50cms) long. It is completely sturdy requiring no staking even in quite windy conditions. This makes it one of the best canna varieties for adding height to the garden. Its sturdiness allows it to be placed towards the rear of the border without worrying about it leaning forwards. Planted in a row at the back of the border gives a lush tropical foliage curtain effect. A little mean with both flowers and seed, this canna variety is best bought as a growing plant or rhizome. Although it is classified as a species canna the resulting seedlings are quite variable. It produces both dark and green foliage seedlings. There are a few varieties within the canna indica purpurea stables so don't just grab the first one you see. The distinguishing feature of this plant is its deep purpley-brown foliage. It looks particularly stunning once the sun has left the garden and you are in the twilight zone. The plant looks best when planted with a green back drop that is taller than the plant. It looks worst when planted in an island bed scenario. Canna indica purpurea also looks particularly good planted in the distance where it adds a touch of mystery to the garden. 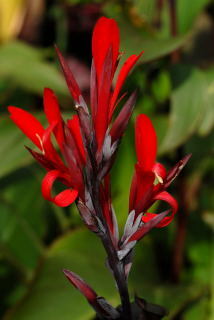 This is another of the canna varieties with large rhizomes. They bulk up quickly. After a few seasons you will have more plants than you know what to do with. As mentioned at the top of the page, there are a huge number of hybrids to chose from. I have dabbled with a few but it is really a question of personal choice. I find that some hybrid varieties concentrate too much on the canna flowers. This can lead to top heavy and ugly plants. Try to see what the plants look like growing before ordering rhizomes. The canna flowers on hybrids can also get a bit messy after rain, turning brown and needing constant tidying up. Of course don't let me put you off. There are a great many beautiful canna hybrids. Just be careful you don't fall into the collecting trap. The three canna varieties detailed above give you a low growing variety that can be used as ground cover (Warscewiczii 2-3 feet (60-90cms) depending on conditions). 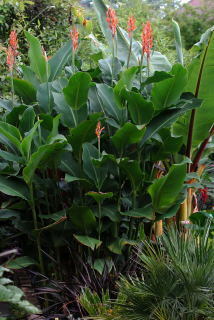 Two tall, strong growing varieties in both dark foliage (canna indica purpurea) and a bright green (canna Altensteinii). Using many more than three canna varieties can lead to canna over kill. The species canna also include cheap insurance against virus in the form of seeds.